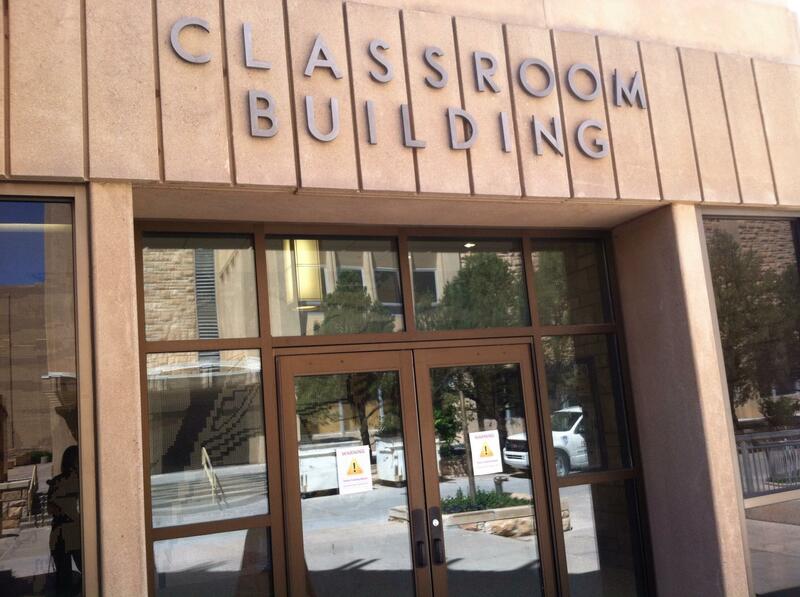 University of Wyoming Police hosted a three-day active shooter training session in the Classroom Building. The purpose was to train law enforcement agencies from across Albany County to collaboratively handle someone who is killing, or trying to kill, people in a confined and populated area. Ever since the 1999 shootings at Columbine High School in Colorado, law enforcement agencies across Wyoming have been have been preparing for how they might handle an active shooter situation. This summer, authorities from agencies across Albany County gathered in Laramie for some high intensity training… together. Rebecca Martinez reports. OFFICER: Come out with your hands up. REBECCA MARTINEZ: Two officers cautiously stalk into a small auditorium in the University of Wyoming’s Classroom Building. Their hand guns are aimed at a man in a baseball cap near the chalkboard. He’s is holding a gun to a young woman’s back. BAD GUY: Yeah, you want them down here, because… you hit her, not me. MARTINEZ: Then the bad guy and the hostage resume their places and a new pair of officers enters the room. DET. RYAN GERDES: Out goal here today is to provide county wide training to all of our law enforcement first responders in the event that they should encounter an active shooter situation. MARTINEZ: That’s Detective Ryan Gerdes of the Laramie Police Department. Laramie P-D and The University of Wyoming Police Department co-hosted three days of active shooter training. An active shooter is someone who is killing, or trying to kill, people in a confined and populated area. Most examples in recent years have happened in schools, but the theater shooting Aurora, Colorado is another example. GERDES: An active shooter situation is not necessarily always a shooting. It could potentially involve somebody who is wielding a knife or a sword. It could involve explosives, anything like that. MARTINEZ: Natrona County authorities applied their active shooter training at Casper College in November when a young man killed a computer science instructor with a bow-and-arrow, and then stabbed himself. University of Wyoming Police Chief Mike Samp organized and oversaw the training drill on U-W’s campus. Instructors combined techniques from two schools of tactical thought: from both the National Tactical Officers Association and the Federal Law Enforcement Training Center. Samp and his Laramie PD counterparts invited a number of local agencies to train, including the Albany County Sheriff’s Office, Wyoming Highway Patrol, the Department of Game and Fish, and Wyoming State Parks. CHIEF MIKE SAMP: We live in a very rural environment here in Laramie, and we do have limited resources. And if a situation were to occur, whether it’s on campus or elsewhere in the community or out in the county, it may be a single individual from several different agencies respond, and this will give us the means to be able to have a collaborative on that response. MARTINEZ: The UW Police Department hopes to coordinate a collaborative training like this each year. They also offer active shooter response training to the rest of the campus community. Vice President for Student Affairs Sara Axelson says these kinds of trainings are among the factors that make UW students feel safe. She says feeling prepared allows students to focus on learning. SARA AXELSON: You don’t want a false sense of safety or a false sense of fear. I think you have to be educated, have your muscle memory in place, have enough communication around safety that people can live and work in an environment where they feel like day in and day out they can get their work done and not be preoccupied that they’re in fear. … And shoots the bad guy clean behind the ear. BAD GUY: Sun of a gun! That was a good shot. MARTINEZ: During the debrief, instructors praised the warden’s marksmanship, but urged him to take more caution when engaging a gunman with a hostage. They say Albany County authorities are doing good work, and they’d rather smooth out the kinks in training before they take on this kind of heat in the field. For Wyoming Public Radio, I’m Rebecca Martinez.